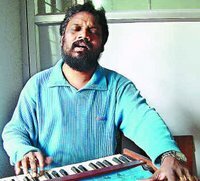 Mohan Sithara-Shining Star In Malayalam Music World. Mohan Sithara,one of the great music directors of malayalam film industry is an outstanding expert who can churn out hit music for the films.He began his musical career as a music director in film industry since 1986 with the film “Onnu Muthal Poojyam Vare”.The song “Raree Rareeram Raro” from this film was a big hit and thus he reserved his place in the array of music directors in Mollywood.Then came big hits from him like Deepasthambam Mahasharyam,Mazhavillu, and so on… After a small gap,he had a bumper return with the grand success of songs in the Kalabhavan Mani starrer “Vasanthiyum Lakshmiyum Pinne Njaanum”.Each and every songs of this film were super duper hits and a glittering period of his career followed.More and more hits came from him like Karumaadikuttan,Ishtam,Rakshasa Rajavu,Mr.Brahmachari,Nammal,Kootu, Kunjikoonan,Sadananthante Samayam,Meerayude Dukhavum Muthuvinte Swapnavum, Swapnakoodu,War & Love,Kazcha,Raapakal,Thanmathra etc….. Sithara is famous for the folk touch in his songs,but also the western touch in his songs from Nammal,Swapnakoodu,Hridayathil Sookshikkaan etc. were also acclaimed by music lovers. At present Sithara runs a music college at Thrissur,which is his native.Still he continues as a shining star among music directors in Mollywood. mudhra filim songs is super. does anyone know where exactly is mohan sitaras music college??? Mr. Mohan Sitara is my best friend. Self & Mr. Mohan Sitara studied in our village Mullassery (Trichur)from 5th std. to 10th std. After finishing our high scool education we have separated. I have heard many songs which was composed by Mr. Mohan. All the songs are very sweet as far as my concern. I pray to god for health & happiness for him and his family. song ”changala dhrutha path athaalam” superb composition by Mohan sithara sir.. Plz hear it.